A labor camp (or labour, see spelling differences) or work camp is a simplified detention facility where inmates are forced to engage in penal labor as a form of punishment under the criminal code. Labour camps have many common aspects with slavery and with prisons (especially prison farms). Conditions at labor camps vary widely depending on the operators. In the 20th century, a new category of labor camps was developed for the imprisonment of millions of people who were not criminals per se, but political opponents (real or imagined) and various so-called undesirables under the totalitarian, both communist and fascist regimes. Some of those camps were dubbed "reeducation facilities" for political coercion, but most others served as backbone of industry and agriculture for the benefit of the state especially in times of war. Labor camps of forced labor were abolished by Convention no. 105 of the United Nations International Labour Organization (ILO), adopted internationally on 27 June 1957. The Allies of World War II operated a number of work camps after the war. At the Yalta Conference in 1945, it was agreed that German forced labor was to be utilized as reparations. The majority of the camps were in the Soviet Union, but more than 1,000,000 Germans were forced to work in French coal-mines and British agriculture, as well as 500,000 in U.S.-run Military Labor Service Units in occupied Germany itself. See Forced labor of Germans after World War II. According to the New Statesman, Burmese military government operated, from 1962 to 2011, about 91 labour camps for political prisoners. The anti-communist Kuomintang operated various camps between 1938 and 1949, including the Northwestern Youth Labor Camp for young activists and students. The Communist Party of China has operated many labor camps for some crimes at least since taking power in 1949. Many leaders of China were put into labor camps after purges, including Deng Xiaoping and Liu Shaoqi. May Seventh Cadre Schools are an example of Cultural Revolution-era labor camps. According to CNN, hundreds — if not thousands — of labor camps and forced-labor prisons (laogai) still exist in modern-day China, housing political prisoners and dissidents alongside dangerous criminals. The Standing Committee of the National People's Congress of the People’s Republic of China, which closed on December 28, 2013, passed a decision on abolishing the legal provisions on reeducation through labor. Beginning in November 1965, people classified as "against the government" were summoned to work camps referred to as "Military Units to Aid Production" (UMAP). After the communists took over Czechoslovakia in 1948, many forced labor camps were created. The inmates included political prisoners, clergy, kulaks, Boy Scouts leaders and many other groups of people that were considered enemies of the state. About half of the prisoners worked in the uranium mines. These camps lasted until 1961. Also between 1950 and 1954 many men were considered "politically unreliable" for compulsory military service, and were conscripted to labour battalions (Czech: Pomocné technické prapory (PTP)) instead. During the colonisation of Libya the Italians deported most of the Libyan population in Cyrenaica to concentration camps and used the survivors to build in semi-slave conditions the coastal road and new agricultural projects. During World War II the Nazis operated several categories of Arbeitslager (Labor Camps) for different categories of inmates. The largest number of them held Jewish civilians forcibly abducted in the occupied countries (see Łapanka) to provide labor in the German war industry, repair bombed railroads and bridges or work on farms. By 1944, 19.9% of all workers were foreigners, either civilians or prisoners of war. The Nazis employed many slave laborers. They also operated concentration camps, some of which provided free forced labor for industrial and other jobs while others existed purely for the extermination of their inmates. A notable example is the Mittelbau-Dora labor camp complex that serviced the production of the V-2 rocket. See List of German concentration camps for more. The Nazi camps played a key role in the extermination of millions. During the early 20th century, the Empire of Japan used the forced labor of millions of civilians from conquered countries and prisoners of war, especially during the Second Sino-Japanese War and the Pacific War, on projects such as the Death Railway. Hundreds of thousands of people died as a direct result of the overwork, malnutrition, preventable disease and violence which were commonplace on these projects. North Korea is known to operate six camps with prison-labor colonies in remote mountain valleys. The total number of prisoners in the Kwan-li-so is 150,000 – 200,000. Once condemned as a political criminal in North Korea, the defendant and his family are incarcerated for lifetime in one of the camps without trial and cut off from all outside contact. Imperial Russia operated a system of remote Siberian forced labor camps as part of its regular judicial system, called katorga. The Soviet Union took over the already extensive katorga system and expanded it immensely, eventually organizing the Gulag to run the camps. In 1954, a year after Stalin's death, the new Soviet government of Nikita Khrushchev began to release political prisoners and close down the camps. By the end of the 1950s, virtually all "corrective labor camps" were reorganized, mostly into the system of corrective labor colonies. Officially, the Gulag was terminated by the MVD order 20 of January 25, 1960. During the period of Stalinism, the Gulag labor camps in the Soviet Union were officially called "Corrective labor camps." 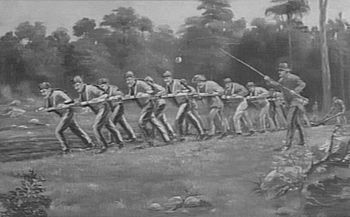 The term "labor colony"; more exactly, "Corrective labor colony", (Russian: исправительно-трудовая колония, abbr. ИТК), was also in use, most notably the ones for underaged (16 years or younger) convicts and captured besprizorniki (street children, literally, "children without family care"). 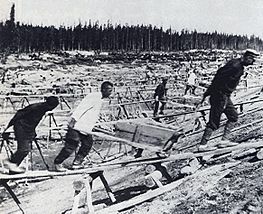 After the reformation of the camps into the Gulag, the term "corrective labor colony" essentially encompassed labor camps. 14 labor camps were operated by the Swedish state during World War II. The majority of internees were communists, but radical social democrats, syndicalists, anarchists, trade unionists, anti-fascists and other "unreliable elements" of Swedish society, as well as German dissidents and deserters from the Wehrmacht, were also interned. The internees were placed in the labor camps indefinitely, without trial, and without being informed of the accusations made against them. Officially, the camps were called "labor companies" (Swedish: arbetskompanier). The system was established by the Royal Board of Social Affairs and sanctioned by the third cabinet of Per Albin Hansson, a grand coalition which included all parties represented in the Swedish Riksdag, with the notable exception of the Communist Party of Sweden. After the war, many former camp inmates had difficulty finding a job, since they had been branded as "subversive elements". The Goli Otok prison camp for political opponents ran from 1946 to 1956. ^ "Labor camps reinforce China's totalitarian rule". Cnn.com. 1984-10-09. Retrieved 2013-03-20. ^ Sivoš, Jerguš. "Tábory Nucených Prací (TNP) v Československu" (in Czech). totalita.cz. Retrieved 2013-03-12. ^ "The Hidden Gulag – Part Two: Kwan-li-so Political Panel Labor Colonies (page 25 – 82)" (PDF). The Committee for Human Rights in North Korea. Retrieved September 20, 2012. ^ Berglund, Tobias; Sennerteg, Niclas (2008). Svenska koncentrationsläger i Tredje rikets skugga. Stockholm: Natur & Kultur. ISBN 9789127026957. ^ (Non-Muslims who couldn't pay the taxes were sent to Labor Camps) Nowill, Sidney E. P. (December 2011). Constantinople and Istanbul: 72 Years of Life in Turkey. Matador. p. 77. ISBN 978-1848767911. "..., and those unable to pay were packed off to a camp at Askale, near Erzerum - an area cooler than Moscow in the winter - where they were put to work breaking stones." ^ Nowill, Sidney E. P. (December 2011). Constantinople and Istanbul: 72 Years of Life in Turkey. Matador. p. 77. ISBN 978-1848767911. "The Askale victims were later sent south to a camp in the Tigris Valley." ^ Peretz, Don (January 1994). The Middle East Today. Greenwood Publishing Group. p. 179. "..., and if the sale failed to produce the required amount, the owners were sent to forced labor camps run by the Ministry of Public Works." ^ Ince, Basak (April 2012). Citizenship and Identity in Turkey: From Atatürk's Republic to the Present Day. I. B. Tauris. pp. 74–75. ISBN 978-1780760261. "Those unable to pay had to work off their debt in labour camps in Askale, in eastern Turkey." ^ Ince, Basak (April 2012). Citizenship and Identity in Turkey: From Atatürk's Republic to the Present Day. I. B. Tauris. p. 75. ISBN 978-1780760261. "Out of 40,000 tax debtors, about 5,000 were sent to these camps, and all of these were members of non-Muslim communities." ^ "US Army Civilian Inmate Labor Program" (PDF). Army.mil. Archived from the original (PDF) on 2003-04-03. The Gulag Archipelago is a three-volume, non-fictional text written between 1958 and 1968 by Russian writer and historian Aleksandr Solzhenitsyn. It was first published in 1973, followed by an English translation the following year. It covers life in the gulag, the Communist Soviet forced labour camp system, through a narrative constructed from various sources including reports, interviews, statements, diaries, legal documents, and Solzhenitsyn's own experience as a gulag prisoner. Laogai, the abbreviation for Láodòng Gǎizào, which means "reform through labor", is a slogan of the Chinese criminal justice system and has been used to refer to the use of penal labour and prison farms in the People's Republic of China (PRC). Láogǎi is different from láojiào, or re-education through labor, which was an administrative detention system for people who were not criminals but had committed minor offenses, and was intended to "reform offenders into law-abiding citizens". Persons detained under laojiao were detained in facilities that were separate from the general prison system of laogai. Both systems, however, involved penal labor. Katorga was a system of penal labor in the Russian Empire and the Soviet Union. Prisoners were sent to remote penal colonies in vast uninhabited areas of Siberia and Russian Far East where voluntary settlers and workers were never available in sufficient numbers. The prisoners had to perform forced labor under harsh conditions. The Solovki special camp, was set up in 1923 on the Solovetsky Islands in the White Sea as a remote and inaccessible place of detention, primarily intended for socialist opponents of Soviet Russia's new Bolshevik regime. At first, the Anarchists, Mensheviks and Socialist Revolutionaries enjoyed a special status there and were not made to work. 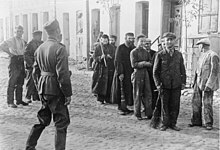 Gradually, prisoners from the old regime joined them and the guards and the ordinary criminals worked together to keep the "politicals" in order. Kolyma is a region located in the Russian Far East. It is bounded by the East Siberian Sea and the Arctic Ocean in the north and the Sea of Okhotsk to the south. The region gets its name from the Kolyma River and mountain range, parts of which were not discovered until 1926. Today the region consists roughly of the Chukotka Autonomous Okrug and the Magadan Oblast. Extermination through labour was the practice of concentration camps in Nazi Germany to kill prisoners by means of forced labour. Arbeitslager is a German language word which means labor camp. Under Nazism, the German government used forced labor extensively, starting in the 1930s but most especially during World War II. Another term was Zwangsarbeitslager. The Vorkutlag, sometimes Vorkuta Gulag, was one of the major Soviet era GULAG labor camps, full name Воркутинский исправительно-трудовой лагерь. It was located in the Pechora River Basin, in the Komi Republic, part of the European region of Russia, located 1,900 kilometres (1,200 mi) from Moscow and 160 kilometres (99 mi) above the Arctic Circle. Vorkuta Gulag was established in 1932 to exploit the resources of the Pechora Coal Basin, the second largest coal basin in the former U.S.S.R.. The city of Vorkuta was established to support the camp. There were approximately 132 sub-camps in the Vorkuta Gulag system during the height of its use in the Soviet prison system. From 1939, Polish prisoners were held here until Russia joined the allies, after it was attacked by Germany. The camp was then also used to hold German P.O.W.s captured on the Eastern Front in World War II as well as criminals, Soviet citizens and those from Soviet united countries deemed to be dissidents and enemies of the state during the Soviet era.